ULTIMATE CUSTOM VIEW HOME. Known as the "White House" Located in Wyndham Hill Estates. 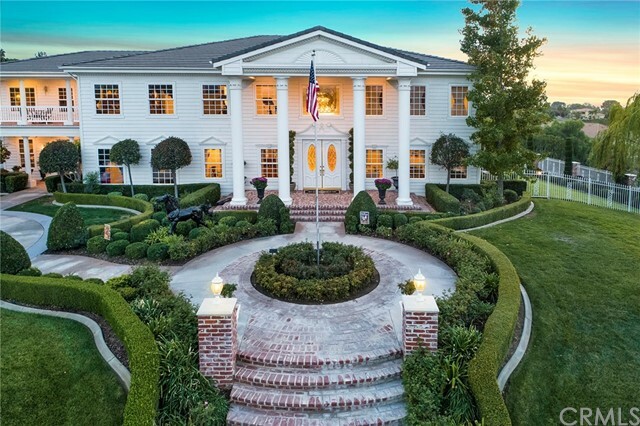 You enter into a 2 story formal entry that boasts of White carrara marble flooring, a living room with a 25&apos;+ ceiling and fireplace, a formal dining room with a built in china cabinet and butlers pantry. Hand painted murals and ceilings by Tiffany Brooks. Open concept kitchen and family room. Kitchen has newly remodeled cabinets, a massive kitchen island, an eat-in area, a large bar and built in desk. Family room has tons of built ins and an oversized brick fireplace, covered patio and view of the City. 2 large bedrooms downstairs (one used as a theatre room but could be used as a second master) both have full baths . The midway office has a full library, rare blue marble fireplace and view of the city. Master bedroom overlooks the City, sitting room with a fireplace, built ins and a HUGE walk in closet. En suite Master bath has a fireplace, jetted tub, carrara marble, walk in shower with phylrich faucets. Casita is 600+ sq ft. included. Under permitting process. The back yard is resort living at its finest. A New Lazy River pool, spa, outdoor shower, Gazebo, outdoor kitchen with bar-b-que and pizza oven. Outdoor California family room with huge fireplace. Lots of Citrus and mature trees. All of this and a gorgeous view. There is too much to list. This property is Turnkey.